This is the barn were Northern Dancer was born on May 27, 1961. It was the beginning of one of Canada’s most historic sports stories in recent memory. The legacy of Northern Dancer is still seen today in the bloodlines of the majority of top race horses. A small group gathered beside the wrought iron fence. The black metal gates formed a small square, enclosing a set of gravestones and burial plots too large for any human. In the middle, the final resting place of Northern Dancer, one of history’s most successful racing horses, born (and now buried) here on Windfields Farm, 55 years ago on May 27, 1961. Conversation is quiet, words about his influence, his legacy and his short, but explosive racing career drift through the air. One of those in attendance is chair of Heritage Oshawa Diane Stephen, whose face brightens when speaking about the famed horse. “It’s Oshawa’s horse,” she says. Another in attendance in Marianne Ortepi (de Gannes), who is not only familiar with the grounds of Windfields Farm, having grown up there as a young girl when her father was resident veterinarian from 1973 to 1987, but also knew the horse that would gallop into the minds of Canadians everywhere. Born in Windfield Farm’s Barn 6, early in the morning on May 27, Northern Dancer was a short and stocky horse, something which prevented him from being sold at the yearling stakes that year. When he was returned to the Oshawa farm, owner E.P. Taylor decided to put the young horse into racing, a decision that would eventually change the landscape of the sport in Canada forever. Following his debut race in Fort Erie in 1963 (which he won), Northern Dancer would have his second, and last, racing year in 1964, which would see him win the Kentucky Derby, obliterating the track record at the time, and later going on to capture the Preakness Stakes, and the Queen’s Plate. Similar to his explosive speed on the track, Northern Dancer was known to have quite the attitude. It was suggested that Taylor have the horse gelded to calm him down. Yet Taylor refused, and Northern Dancer would go on to have a career as a stud that would rival his accomplishments on the track. According to Muriel Lennox, author of Northern Dancer: The Legend and his Legacy, Northern Dancer would sire 635 foals in 23 breeding seasons. Eighty per cent of those horses would go on to become race horses, and further, 80 per cent of those horses would go on to become winners, and 146 of them stakes winners, making Windfields Farm a top source in the world for stakes winners. “It was all kind of these twists of fate that brought him to be the little hero that he became for Canada,” says Ortepi. Even after his death nearly 26 years ago in November 1990, the legacy of Northern Dancer lives on in the bloodlines of today’s great race horse. For context, every horse that took part in the Kentucky Derby and the Preakness States in 2015 can be traced back to Northern Dancer. 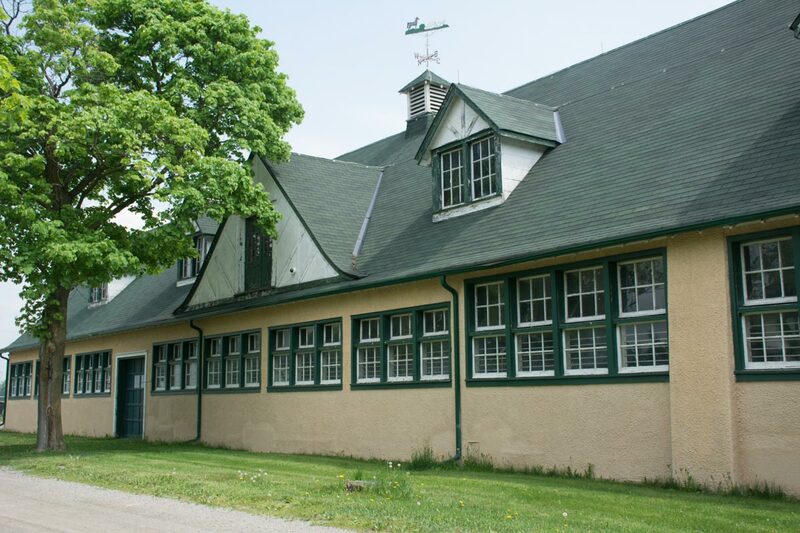 The group around the iron fence move on to Barn 6, the birth place of Northern Dancer, and further on to some of the other buildings still standing on the historic farm, now property of the University of Ontario Institute of Technology. Now, preservation efforts are underway to keep many of the notable buildings from decay, including Barn 6, the foaling barn and arena, even as the roar of bulldozers can be heard from the Tribute subdivision project creeping from the ground next door. Ortepi has high hopes for her past home (the house she grew up in still stands today and is used as offices by UOIT), keeping her fingers crossed that one day, people will be able to walk the grounds as she did, and to preserve the farm’s legacy.